Iliopsoas! Say that ten times fast! Do you know what the heck an iliopsoas is? I didn’t until this week. This past Saturday at Rally class, Bear didn’t seem quite right. His pivots weren’t as enthusiastic as usual and while he was excited to work he was slow and lagging behind a bit. This was uncharacteristic behavior for him. Wondering if he just needed a break, we stopped and did some of the tricks he likes to do like spin, turn , hide your eyes and sit pretty and even those did not perk him up. If I was a more traditional trainer I might have assumed he was “blowing me off” but knowing Bear, I knew something was wrong. We tried a jump (he loooooooves jumping) and on his way out he was not moving quickly and his gait was off. I decided to limit our participation for the rest of class to heeling and sits, which didn’t seem to cause any trouble. He could barely climb into the car after class to get home and then he was equally slow climbing the 5 steps to the house. Once inside, he tried to get up onto his favorite couch spot but got half way, whimpered and then went to his kennel and lay down. Once I was able to coax him out of the kennel, I poked and prodded to see if I could feel and swelling, any heat, bleeding or any foreign objects. Taking a wild guess, I applied some ice packs to his inner thighs, he lay there quietly and I took this as a sign that maybe the cold was providing some comfort. That night the stairs were a no go and, since I did not want to sleep on the couch, I carried Bear up – not as easy as I imagined. Sunday morning Bear managed to walk downstairs but he spent most of the morning on the floor or in his kennel which is highly unusual. When we are at home he is usually following me around, taking my spot on the sofa if I get up, waiting for me outside the bathroom door, trying to sneak into the kitchen if I’m in there making lunch, supervising when I load the dishwasher, etc. Since he appeared to be in more pain than he day before, I gave him a buffered aspirin, one of the safer human anti-inflammatories for dogs. The only anti-inflammatory Bear has received in his life was given immediately after his neuter surgery so I went with a low dose for a dog his size and continued to ice the area that seemed sore. I went online and consulted with Dr. Google, DVM. She said he likely had hip dysplasia, or tore his ACL or had a neurogical condition. Since I had myself convinced of the worst, I had to get in to see the vet, Dr. Radcliffe, so she could either to put my mind at rest or to confirm Dr. Google’s diagnosis. I called, and luckily she was in and had appointments available. She watched him moving then she poked, prodded and stretched Bear’s legs in every conceivable direction (at least to me) and he seemed ok. Then, she finally extended this leg ALL the way back and rotated it inwards. This elicited a squeal on both sides and she said she suspected it was a muscle injury. She consulted with her notes and decided it was likely iliopsoas injury. She did an infrared treatment and suggested rest, light exercise (walking), massage, stretches to maintain range of motion, icing and, perhaps later on, some more infrared treatments or even acupuncture. She also sent me a one page info sheet from a veterinary surgeon about this kind of injury. According to my research, the iliopsoas is a hip flexor and is used during jumping, tight turns etc. to keep the dog stable. 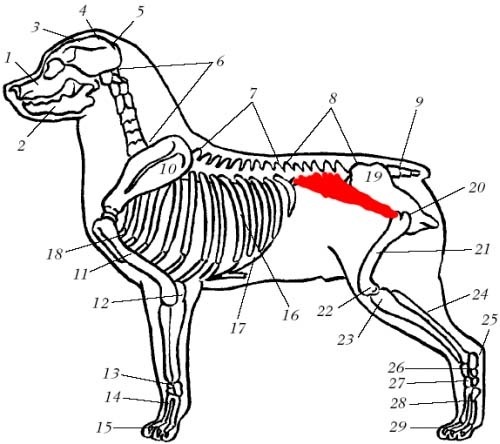 My crude ‘artists rendering’ of where this pesky little muscle is – actually there are 2 of them – one on each side. I am a little disappointed – we were just getting back into agility and had a seminar this weekend, we also were making plans to begin herding but alas, it looks like our plans will be postponed. Fortunately, having played nearly 15 years of rugby and run 2 half marathons, I understand the consequences of pushing through pain and with a 7 year old dog (or any dog) it’s just not worth it. I contacted Bear’s Canine Massage Therapist (don’t laugh!) about the injury. She is planning on visiting soon (she lives about 2.5 hours away from us) but I wanted to let her know sooner would be better than later. She basically said that massage is good for keeping everything else in that area but that this was was a difficult muscle to reach. In my crude drawing it’s there and obvious but it is covered with lots of muscle. She suggested an appointment with someone who specializes in canine rehab might help best with the specific injury. So after trading a few more phone calls with the vet clinic (I know their number by heart now – how bad is that) I learned that someone in Brandon, who I know, has completed her canine rehab course. I’m not telling you who yet because I’m sure once word is out, she will be flooded with calls and right now, she’s not officially taking clients. When the Canine Rehab Therapist came to see Bear and we did more walking, trotting and she did some manipulation etc, she said she was certain he would recover quite well if I can stick with the program. According to her the program will consist of icing then ice followed by heat, stretches, and eventually rehab exercises. She said the thing Bear has going for him is that he allows touch and heat/ice packs and he is very responsive to training so teaching the rehab exercises will be easy. The program also entails keeping him from jumping until he is healed – jumping off things, onto things or doing other crazy jumping dog things – this is going to be the hard part. She’s going to put the plan on paper and until we get the plan we’re going to use our ice packs, our hot pads and maybe our tracking harness since walking (with his nose) is about the only activity he can do right now. Fortunately water is a tracker’s best friend and there is lots of rain in the forecast for this weekend! I’ll follow up with an update at the end of the week – Our rehab plan should be interesting! Poor Bear 😦 Several of my agility friend’s dogs have had iliopsoas injuries and they had to be very diligent about keeping up with the exercises to get that muscle healed. Have you looked at giving Bear Traumeel? It is a homeopathic remedy that is good for sprains and such. One of my dogs currently has a bad neck injury and cannot have any anti-inflammatories because she has has chronic renal failure so she is taking Traumeel as recommended by my vet. I have been using it for years actually before and after agility trials. It is good for people too! Actually yes, he’s been on Traumeel tablets since Tuesday! I have used it around here for canine and human pain. I like the gel form but of course his coat is NOT conducive to gels or creams and a shaved rottie is JUST WRONG! He’s also on salmon oil, a joint supplement and Raw food. I found an article from Clean Run (http://www.vetsportsmedicine.com/pdf/Proof_Non-responsiveHind-limbLamenessa.pdf) and my understanding is that chronic injuries take longer to heal and recovery is better when you can be on top of things right away…..we’ll see….. Interesting article – thanks for the link! Are you still doing draft stuff? I’m hoping to be ready for the DDX test in Regina this fall. We still need lots of work before then. We are going to try for the DD if Bear is allowed! I have ordered a pack so we could start training for freight haul. I figure we’ll be ready in…oh…a million years for the DDX! Awesome!!!!! Have you applied for Bear’s PEN?